A suit against the state of Michigan brought by Flint resident Melissa Mays and three nonprofit groups was settled yesterday for $97 million to be spent, among other things, on new water service lines to replace those that have been leaching lead into the city’s water. The water lines for 18,000 households will be examined for possible replacement. Mays and three nonprofits—Concerned Pastors for Social Action, the Natural Resources Defense Council, and the American Civil Liberties Union of Michigan—filed the lawsuit more than a year ago. A mediator has been working with the case since December and passed along his recommendations to U.S. District Judge David Lawson, who made a final ruling yesterday. 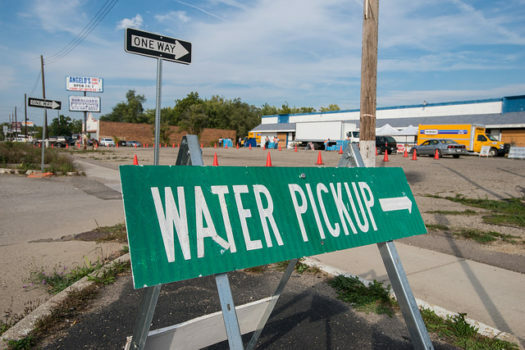 The settlement requires the state to continue to operate nine bottled water and filter distribution centers through September 1st, with clearly designated procedures for closing any of them. It also mandates expanded Medicaid services to cover such programs as monitoring the blood of local children for elevated lead levels. More details are available in this Detroit Free Press report. A new study shows that 93.5 percent of children entering kindergarten in Cleveland have been exposed to lead, but the city struggles to garner support for prevention—or even remediation.